Tiger is a neutered male kitty that presented to us when his owner noticed he had little to no urine in his litter box, and was dribbling small spots of urine mixed with blood around the house, which is very unlike him. On examination Tiger was alert and responsive, but when Dr. Rebecca Gounaris palpated his bladder, it was completely full and very firm, the size of a large orange. Tiger was also very agitated when we felt his bladder. Based on the history and exam, we quickly concluded that Tiger's urethra was obstructed; this presentation is what we call a "blocked" cat. A blocked cat is an emergency situation. Without intervention, cats become incredibly sick and can even die, as the toxins that should be eliminated through the urine build up in the bloodstream, and they experience electrolyte imbalances, most dangerously, high potassium, which can cause life-threatening cardiac arrhythmias (abnormal heart beats). Additionally, if the bladder cannot empty, the pressure can cause the bladder to rupture. Above is an x-ray we took of Tiger's bladder prior to unblocking. The arrows are pointing to the margins of the bladder. As you can see, it is taking up a large proportion of this poor kitty's abdomen and is very distended. Dr. Rebecca Gounaris and crew quickly brought Tiger back for bloodwork, hospitalization, and most importantly, to clear the blockage in Tiger's urethra. 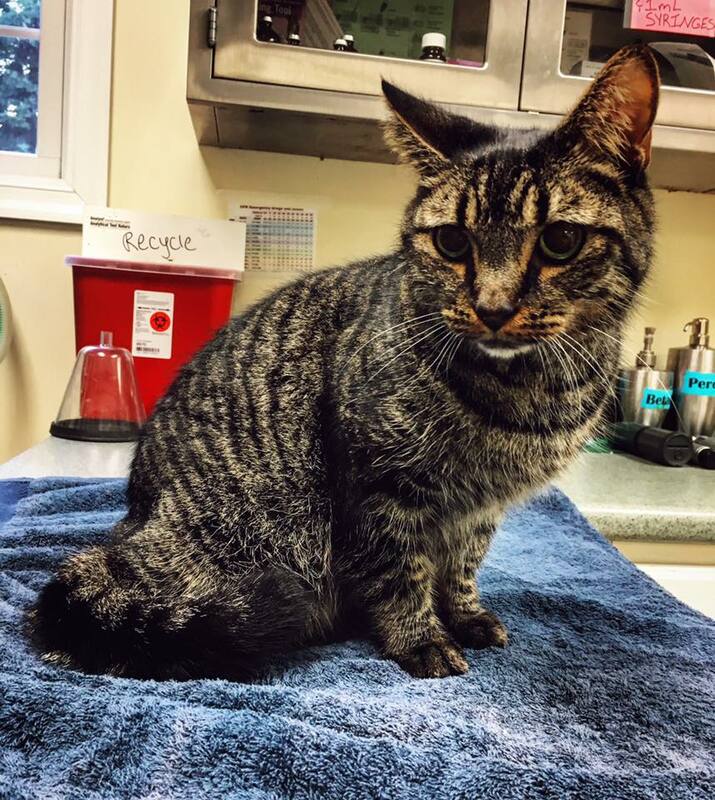 Luckily, Tiger's bloodwork was pretty good; he had mild electrolyte abnormalities but nothing terrible, meaning that the owner caught this condition early, and Tiger was still feeling relatively good, but was uncomfortable. In order to clear the blockage, we had to pass a urinary catheter and attempt to flush out the blockade. This procedure is a difficult balance; we need to flush with enough pressure to relieve the blockage, while still advancing the catheter delicately enough to prevent injury to the urethra. With some difficult we were finally able to clear the blockage and express Tiger's bladder to relieve the pressure. 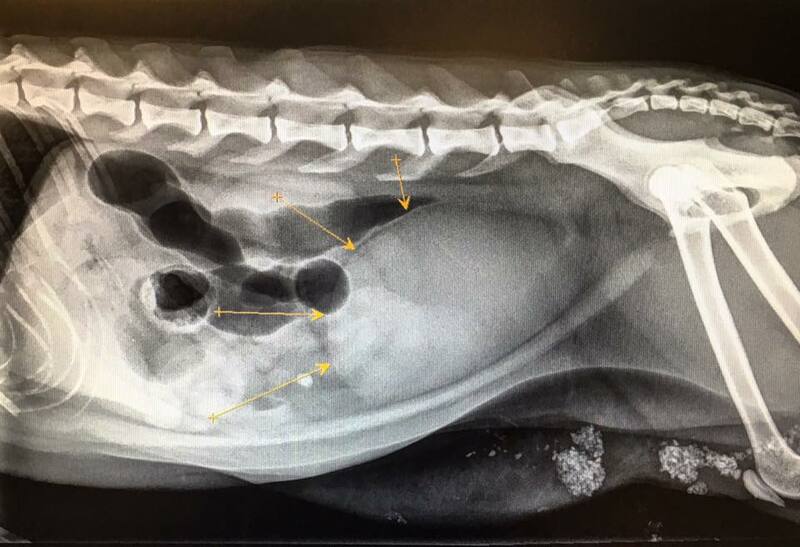 Above is an x-ray we took after relieving the urethral blockage. Once again, the arrows are pointing to the margins of the bladder, which is much smaller than Tiger's original presentation. Tiger stayed with us for a few days, receiving pain medications, anti-inflammatories, and fluids. After the blockage is relieved, there is still a lot of inflammation present, and cats are at risk of re-blocking, so it is important they remain under veterinary care. Tiger luckily did great; he did not reblock, was using the litterbox well, and was able to go home after a few days! Some cats are not this lucky, and may need further hospitalization or even surgery if the blockage cannot be relieved. Male neutered cats are at greatest risk of becoming blocked due to their very narrow urethra. 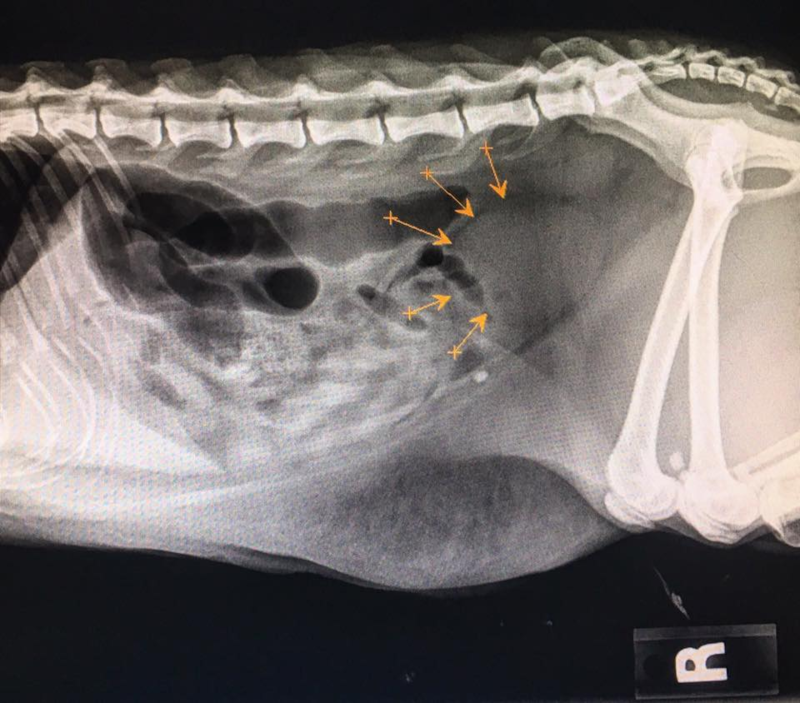 Urethral blockages are a consequence of a much larger syndrome called feline lower urinary tract disease (FLUTD), a syndrome that is still poorly understood. The blockage can be caused by sand, stones, crystals, mucous plugs, or inflammation. Once a cat has blocked, it is always at risk of blocking again; to try to prevent this, we recommend urinary tract-friendly diets, free access to water, and providing as much of a stress-free environment as possible. If you ever suspect your cat is blocked (empty litter box, dribbling urine, straining to urinate, crying out, etc) it is important that you take them to a licensed veterinary as soon as possible, as this is considered a true emergency, but is luckily an easily diagnosed and often treatable condition!